The Opposition and Democratic Party leader, Lulzim Basha met in his office with the Ambassador of the Russian Federation Alexander Karpushin. Basha during the meeting answered to the ambassador Karpushin interest in the political developments in the country. On the other side Mr Karpushin underlined that the basic principle of the foreign policy of Russia, which stands the Russian Embassy in Tirana, is the non-interference in the principles of the internal affairs of other countries, Albanian media close to the opposition reports. Karpushin stressed that the Russian Federation considers that there is untapped potential for increasing the economic cooperation between our two countries and hopes that in future to be worked to increase the level of cooperation. 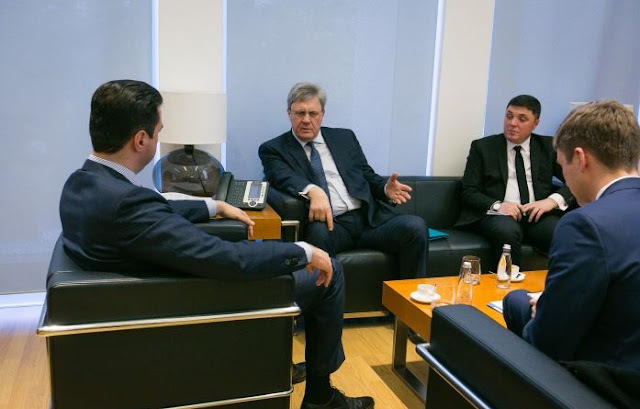 Karpushin expressed confidence that a strong impetus to bilateral economic exchanges will give the meeting in Tirana in April the co-heads of Russia-Albania Intergovernmental Commission on Trade, Economic Cooperation, Technical and Science, and next session of this Commission that is expected to be held in the autumn, when the new government of Albania will be formed. Basha and Ambassador Karpushin evaluated as such constructive communication and recognized that different views on some issues should not hamper efforts to explore areas of mutual cooperation.